ETFs have rapidly gained popularity and are continuing to attract assets and evolve. And that should come as no surprise as they are marketed as an investment that offers individuals the chance to invest like the most sophisticated institutions in the world. 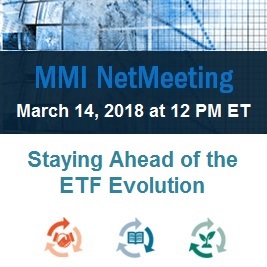 This installment of the MMI NetMeeting series focuses on the latest trends and product development innovations impacting the ETF sector and explores where the industry goes from here. In this video replay, our expert panel sorts through what you need to know, what's a fad, and what to expect going forward. Please follow this link to view a replay of the NetMeeting. Please do not share this presentation externally. This NetMeeting replay is not intended for members of the media. Please contact MMI with any questions at (646) 868-8500 or events@mminst.org.